As much as we enjoyed our previous weeks up in chilly Missouri and Kansas, the warmth of the Houston sun welcomed us with open arms. The last time I was in Houston I saw my relatives who live in Sugar Land. 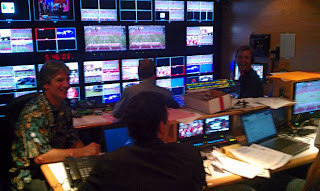 This week we had a packed schedule and not much free time, so we mixed business with pleasure and had a great few days! 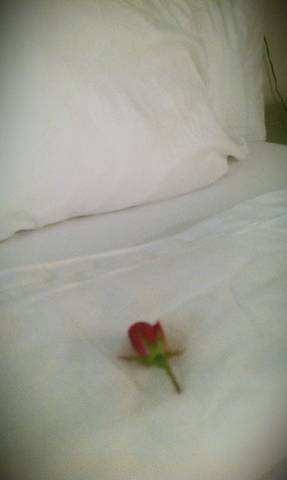 The night we got into town I turned around and this little flower appeared on the bed. My hubby's one of the good ones! Then, as I was just walking around I ran into the Ultimate Tailgate bus. This bus is incredible and is at every Big 12 game. The driver invited me in for a little looksy... It was definitely built for a rock star! Then the best thing ever happened! A little lady named Stephanie from BEAUtiful Mess walked right into my line of vision. I frantically began waving at her in an uncontrollable and semi-embarrassing fashion. You see, I feel like I know Stephanie and Beau, so it was only natural to act like a total fool around them! Stephanie and I had planned to meet up at the tailgate and I was so glad that she actually found me. Let me tell you quickly about Steph -- she's even more gorgeous in person, her eye lashes go on for miles and miles and shockingly enough, the girl sounds like a Californian! I was stunned... Girlfriend's got no southern accent. Sorry Steph, just outted you! And not only did I meet Stephanie, but I met Beau and his parents. Not gonna lie, I kinda felt like part of the family and can't wait to see them again! The next night Bryan and I ventured out to one of our all-time favorite restaurants from California. We generally don't eat at chains while on the road, but this chain is one that we do not have in Charlotte, so it was a must! 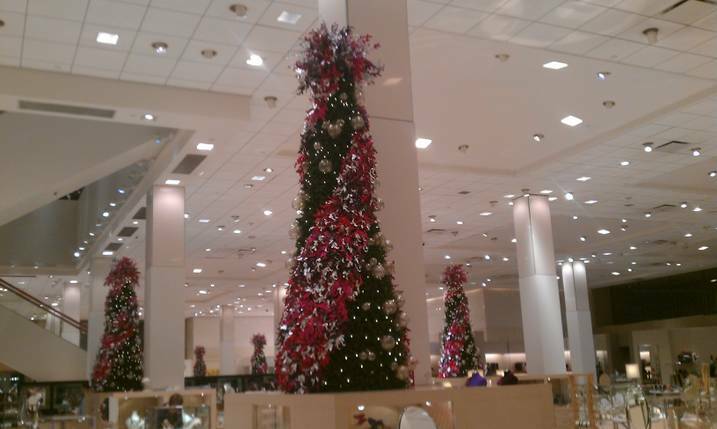 We didn't even need to open the menu, as we ordered "the usual"
Neiman's was decorated for Christmas BEFORE Halloween. No cool! Definitely meeting Stephanie and Beau! And Yardhouse...oh Yardhouse...if y'all went to one in City Center (I-10 and the Beltway) that is LITERALLY 2 miles from our house!!! I SO wish we hadn't already planned to go out of town or we so would crashed y'all's date. how can you still be so gorge even in a t-shirt? i hate you. 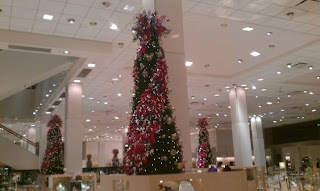 are blogger meet-up's fun? and scary? i've had a few in my day and it's so weird when people are like "oh how do you know each other?" so glad y'all got to meet and love each other. those awkward blogger meet-ups are not fun. i hope whenever we meet it's not awkward...j/k...it won't be. i'm a blast in a glass. I used to live in Sugarland! I started high school in South Carolina but my family moved to SL mid-semester one year. My parents still live there. Glad to know you have family there. It's full of good people :)!!! I'm so happy for you and Steph that ya'll got to meet up! She even has me saying ya'll now. haha I love that she doesn't have an accent..it's too funny. She texted me right after your meet up and was beyond excited :) NEXT is my turn!! Love Yardhouse at CityCentre! That's where we watched the World Series on Friday night and the spinach artichoke dip is to die for! So glad Houston treated you right! How fun! I love that you two go to meet IRL! You look so cute! Still loving this brunette hair of yours :) HAPPY THURSDAY! Nice choice of city :) I love Houston. I see it treated you well! I love that you met Steph!! Shes my bestest and the Howards are AMAZING! !